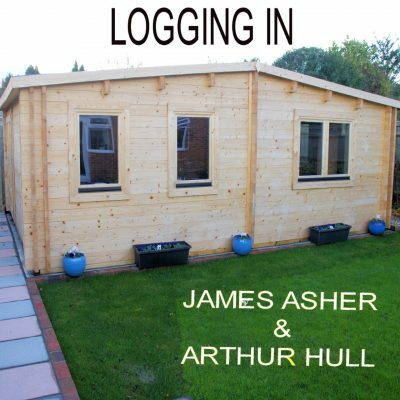 James Asher and Arthur Hull unite again in the unique environment of the newly built log cabin studio to explore further exploits in the the realms of rhythmical alchemy. Arthur and I began exploring different rhythm grooves and came up with a songlike structure. Just as we did this I met an amazing singer called Heidi Burson from Nashville in a local jam session, and she wrote lyrics to the backing track I created with Arthur (Arthur plays congas on this). She came up with a lyrical idea describing what goes in a pub in a jam session, and who could argue with the chorus lyrics `Music and People come together`? – I loved her vocal and she also did great backing vocals. My friend Tom Fairbairn helped me record drumkit in my newly finished log cabin studio. The ambience from all that great smelling pine sounded fresh. Good to discover it has fine acoustic properties. This track is upbeat, rousing and gutsy. Arthur Hull played a bunch of excellent percussion with something of an African/Latin kind of flavour. Around this I wrote a bass riff and a melody. Duncan White who runs the local jazz jam session, and whose sizzling sense of rhythm caught my ear came and played guitar. Then my friend Tom Fairbairn who helped me record the drums on Music and People played some bass that really caught the feel. My other guitarist friend Tom Askaroff added some funky rock lead playing, and the result is the kind of richness I love with different players bringing their own unique flavour to an overall infectious groove. Slightly Herbie Hancock as in his Headhunters phase. Ah the indomitable Arthur! He is often described as an elf like character himself. When you think of all the diverse global communities he has inspired and empowered to collectively find and share rhythmic grooves it is really impressive. Team building, community sharing, dissolving the barriers between groups and enjoying the power of the collective harmoniously in action. So this piece is very much my giving musical voicing to his vision of innocent playfulness. Light, happy, and joyous.It is great and very lucky for me to have a friend that so encourages me to unite with him in playfulness and as the saying goes – `Let your magic tortoise go…………………………..` We have shared many adventures, including the crazy coin counting solo I did in the track `Who`s Counting`, as a wry comment on the recession which was especially prevalent at the time we did it. Arthur is a one-off, and amazing.